PyOD is a comprehensive and scalable Python toolkit for detecting outlying objects in multivariate data. This exciting yet challenging field is commonly referred as Outlier Detection or Anomaly Detection. Since 2017, PyOD [AZNL19] has been successfully used in various academic researches and commercial products [AKalayciE18][ARSLS19][AWZX19][AZH18a][AZH18b][AZNHL19]. It is also well acknowledged by the machine learning community with various dedicated posts/tutorials, including Analytics Vidhya, KDnuggets, Computer Vision News, and awesome-machine-learning. Unified APIs, detailed documentation, and interactive examples across various algorithms. Advanced models, including Neural Networks/Deep Learning and Outlier Ensembles. Optimized performance with JIT and parallelization when possible, using numba and joblib. Compatible with both Python 2 & 3. Note on Python 2.7: The maintenance of Python 2.7 will be stopped by January 1, 2020 (see official announcement) To be consistent with the Python change and PyOD’s dependent libraries, e.g., scikit-learn, we will stop supporting Python 2.7 in the near future (dates are still to be decided). We encourage you to use Python 3.5 or newer for the latest functions and bug fixes. More information can be found at Moving to require Python 3. Zhao, Y., Nasrullah, Z. and Li, Z., 2019. PyOD: A Python Toolbox for Scalable Outlier Detection. arXiv preprint arXiv:1901.01588. PyOD paper is accepted at JMLR (machine learning open-source software track) with minor revisions (to appear). The comparison among of implemented models is made available below (Figure, compare_all_models.py, Interactive Jupyter Notebooks). For Jupyter Notebooks, please navigate to “/notebooks/Compare All Models.ipynb”. Check the latest benchmark. You could replicate this process by running benchmark.py. The following APIs are applicable for all detector models for easy use. pyod.models.base.BaseDetector.fit(): Fit detector. y is optional for unsupervised methods. pyod.models.base.BaseDetector.decision_function(): Predict raw anomaly score of X using the fitted detector. pyod.models.base.BaseDetector.predict(): Predict if a particular sample is an outlier or not using the fitted detector. pyod.models.base.BaseDetector.predict_proba(): Predict the probability of a sample being outlier using the fitted detector. pyod.models.base.BaseDetector.fit_predict(): [Deprecated in V0.6.9] Fit detector first and then predict whether a particular sample is an outlier or not. pyod.models.base.BaseDetector.fit_predict_score(): [Deprecated in V0.6.9] Fit the detector, predict on samples, and evaluate the model by predefined metrics, e.g., ROC. pyod.models.base.BaseDetector.decision_scores_: The outlier scores of the training data. The higher, the more abnormal. Outliers tend to have higher scores. pyod.models.base.BaseDetector.labels_: The binary labels of the training data. 0 stands for inliers and 1 for outliers/anomalies. Note : fit_predict() and fit_predict_score() are deprecated in V0.6.9 due to consistency issue and will be removed in V0.7.2. To get the binary labels of the training data X_train, one should call clf.fit(X_train) and use pyod.models.base.BaseDetector.labels_, instead of calling clf.predict(X_train). [AAgg15] Charu C Aggarwal. Outlier analysis. In Data mining, 75–79. Springer, 2015. [AAS15] (1, 2, 3, 4, 5) Charu C Aggarwal and Saket Sathe. Theoretical foundations and algorithms for outlier ensembles. ACM SIGKDD Explorations Newsletter, 17(1):24–47, 2015. [AAP02] (1, 2, 3) Fabrizio Angiulli and Clara Pizzuti. Fast outlier detection in high dimensional spaces. In European Conference on Principles of Data Mining and Knowledge Discovery, 15–27. Springer, 2002. [ABKNS00] Markus M Breunig, Hans-Peter Kriegel, Raymond T Ng, and Jörg Sander. Lof: identifying density-based local outliers. In ACM sigmod record, volume 29, 93–104. ACM, 2000. [AGD12] Markus Goldstein and Andreas Dengel. Histogram-based outlier score (hbos): a fast unsupervised anomaly detection algorithm. KI-2012: Poster and Demo Track, pages 59–63, 2012. [AHR04] Johanna Hardin and David M Rocke. Outlier detection in the multiple cluster setting using the minimum covariance determinant estimator. Computational Statistics & Data Analysis, 44(4):625–638, 2004. [AHXD03] Zengyou He, Xiaofei Xu, and Shengchun Deng. Discovering cluster-based local outliers. Pattern Recognition Letters, 24(9-10):1641–1650, 2003. [AJHuszarPvdH12] JHM Janssens, Ferenc Huszár, EO Postma, and HJ van den Herik. Stochastic outlier selection. Technical Report, Technical report TiCC TR 2012-001, Tilburg University, Tilburg Center for Cognition and Communication, Tilburg, The Netherlands, 2012. [AKalayciE18] İlker Kalaycı and Tuncay Ercan. Anomaly detection in wireless sensor networks data by using histogram based outlier score method. In 2018 2nd International Symposium on Multidisciplinary Studies and Innovative Technologies (ISMSIT), 1–6. IEEE, 2018. [AKZ+08] (1, 2) Hans-Peter Kriegel, Arthur Zimek, and others. Angle-based outlier detection in high-dimensional data. In Proceedings of the 14th ACM SIGKDD international conference on Knowledge discovery and data mining, 444–452. ACM, 2008. [ALK05] (1, 2) Aleksandar Lazarevic and Vipin Kumar. Feature bagging for outlier detection. In Proceedings of the eleventh ACM SIGKDD international conference on Knowledge discovery in data mining, 157–166. ACM, 2005. [ALTZ08] Fei Tony Liu, Kai Ming Ting, and Zhi-Hua Zhou. Isolation forest. In Data Mining, 2008. ICDM‘08. Eighth IEEE International Conference on, 413–422. IEEE, 2008. [ALTZ12] Fei Tony Liu, Kai Ming Ting, and Zhi-Hua Zhou. Isolation-based anomaly detection. ACM Transactions on Knowledge Discovery from Data (TKDD), 6(1):3, 2012. [ALLZ+18] (1, 2) Yezheng Liu, Zhe Li, Chong Zhou, Yuanchun Jiang, Jianshan Sun, Meng Wang, and Xiangnan He. Generative adversarial active learning for unsupervised outlier detection. arXiv preprint arXiv:1809.10816, 2018. [APKGF03] Spiros Papadimitriou, Hiroyuki Kitagawa, Phillip B Gibbons, and Christos Faloutsos. Loci: fast outlier detection using the local correlation integral. In Data Engineering, 2003. Proceedings. 19th International Conference on, 315–326. IEEE, 2003. [ARSLS19] Jagdish Ramakrishnan, Elham Shaabani, Chao Li, and Mátyás A Sustik. Anomaly detection for an e-commerce pricing system. arXiv preprint arXiv:1902.09566, 2019. [ARRS00] (1, 2, 3) Sridhar Ramaswamy, Rajeev Rastogi, and Kyuseok Shim. Efficient algorithms for mining outliers from large data sets. In ACM Sigmod Record, volume 29, 427–438. ACM, 2000. [ARD99] Peter J Rousseeuw and Katrien Van Driessen. A fast algorithm for the minimum covariance determinant estimator. Technometrics, 41(3):212–223, 1999. [AScholkopfPST+01] Bernhard Schölkopf, John C Platt, John Shawe-Taylor, Alex J Smola, and Robert C Williamson. Estimating the support of a high-dimensional distribution. Neural computation, 13(7):1443–1471, 2001. [ASCSC03] Mei-Ling Shyu, Shu-Ching Chen, Kanoksri Sarinnapakorn, and LiWu Chang. A novel anomaly detection scheme based on principal component classifier. Technical Report, MIAMI UNIV CORAL GABLES FL DEPT OF ELECTRICAL AND COMPUTER ENGINEERING, 2003. [AWZX19] Yu Weng, Ning Zhang, and Chunlei Xia. Multi-agent-based unsupervised detection of energy consumption anomalies on smart campus. IEEE Access, 7:2169–2178, 2019. [AZH18a] (1, 2) Yue Zhao and Maciej K Hryniewicki. 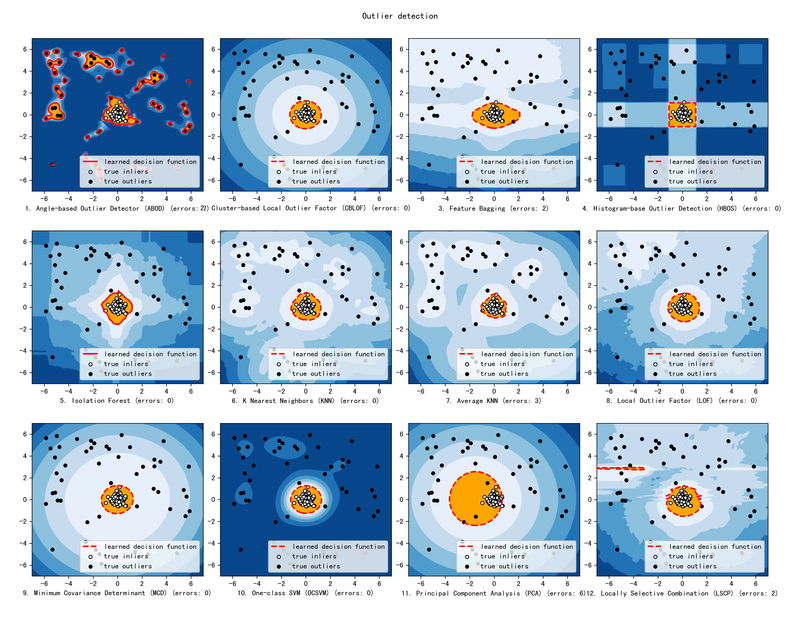 Xgbod: improving supervised outlier detection with unsupervised representation learning. In Neural Networks, 2018. Proceedings of the International Joint Conference on. IEEE, 2018. [AZH18b] Yue Zhao and Maciej K. Hryniewicki. Dcso: dynamic combination of detector scores for outlier ensembles. In ACM SIGKDD Workshop on Outlier Detection De-constructed (ODD v5.0). ACM, 2018. [AZNHL19] (1, 2, 3) Yue Zhao, Zain Nasrullah, Maciej K Hryniewicki, and Zheng Li. LSCP: locally selective combination in parallel outlier ensembles. In SIAM International Conference on Data Mining (SDM). Calgary, Canada, May 2019. Society for Industrial and Applied Mathematics. [AZNL19] Yue Zhao, Zain Nasrullah, and Zheng Li. Pyod: a python toolbox for scalable outlier detection. arXiv preprint arXiv:1901.01588, 2019. © Copyright 2018, Yue Zhao Revision a6b70d4c.